BAD!SLAM!NO!BISCUIT! IS THE POETRY SLAM THAT GIVES YOU A STAGE, A MICROPHONE, AND TWO MINUTES WITH NO MUSIC NO PROPS AND YOUR ORIGINAL MATERIAL FOR FIRST PRIZES. Yes, that’s right, THE POETRY SLAM, and BAD!SLAM!NO!BISCUIT! wants you! It wants you to give it your words, your arm waving, your pointing finger masses yearning to be free. Free from the bonds of your hips and knees, free of your mouth, free of having to wash the dishes after dinner and take out the garbage! 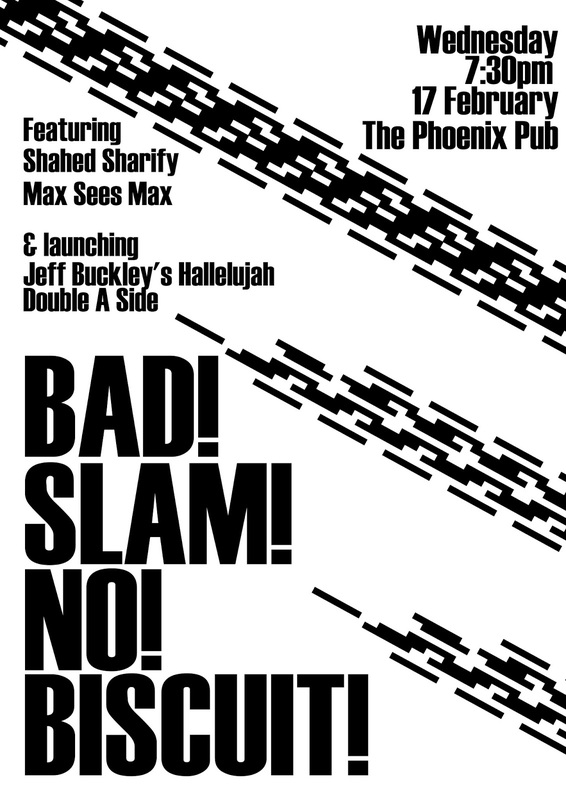 And for this special February event of BAD!SLAM!NO!BISCUIT! we bring you the feature act Shahed Sharify, the visual odyssey Max Sees Max, and the launch of Jeff Buckley’s Hallelujah Double A Side. This is what Shahed Sharify had to say for himself when asked for his 100 word bio! BRING YOUR WORDS, BRING YOU, BRING YOUR FAVOURITE PET. And remember 2 minutes, no music, no props, your original material- unless you’re a rebel rule-breaker for whom rules mean nothing.